Today I’m continuing my hunt for Watch List shares with a look at Dewhurst (DWHA). DWHA was established in 1919 and has since evolved into a specialist designer and manufacturer of buttons and keypads for lifts and cash machines. Recent years have seen the group develop other components for lifts, such as level displays and door ‘gongs’. DWHA floated during 1948 but my archives stretch back only to 1999, when revenues were £19.9m, adjusted operating profits were £1.8m and the dividend was 3.45p per share. By 2014, revenues had reached £46.6m, adjusted operating profits were £5.5m while the dividend had advanced to 9p per share. DWHA has suffered three setbacks during the last 15 years. Profits i) fell 24% during 2001 following a costly factory refurbishment; ii) dived 13% during 2006 due to a “continual downward pressure on prices”, and; iii) slid 27% during 2013 after bumper keypad sales from the previous year weren’t repeated. Nonetheless, the dividend has made dependable progress over time. It was lifted throughout the banking crash and the 2013 annual report claimed the payout had advanced by more than 5% in 31 of the last 32 years. Impressive stuff. Results from the last few years have been blighted somewhat by goodwill write-offs totalling £5.6m. During the last ten years, DWHA has spent almost £11m — about a quarter of its aggregate operating profit reported for the same time — on purchasing new subsidiaries, associate investments and assets of other businesses. The latest balance sheet displays share capital of £1m versus earnings retained by the business of £20m. Furthermore, no new shares have been issued since 2001. At the last count, cash was £12.9m while debt was zero. A bonus is property with a book value of £7.3m. 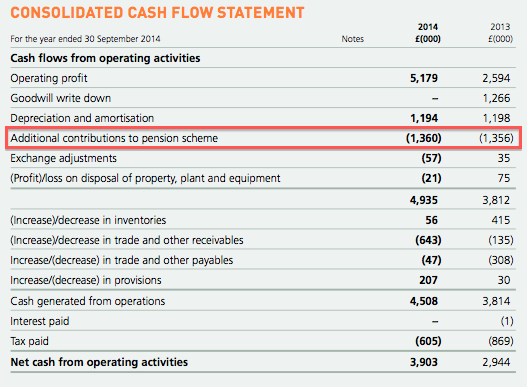 Counterbalancing the assets, however, is a £12.2m pension deficit. This liability is greater than DWHA’s annual profits and therefore means the firm fails one of my balance-sheet tests. During the last five years, DWHA has pumped some £6.1m of such additional contributions into its pension scheme. And yet in the same time, the deficit has doubled from £6.1m to £12.2m. The ballooning deficit has been due to the adverse changes made to the assumptions used to determine the scheme’s liabilities — not least a lower interest/discount rate, which increases the net present value of the scheme’s future obligations. Such changes have added an enormous £12.2m to the deficit since the end of 2009. Anyway, to put DWHA’s additional pension contributions into perspective, that £6.1m put into the scheme is equivalent to 71p per share and compares to the £3.4m paid out as dividends over the same five years. Had DWHA not had a defined-benefit pension scheme, that 71p per share could have been dished out to shareholders as well. As it is, the current £12.2m deficit suggests additional annual contributions of £1.4m could be needed for some time to come. Granted, the last five years have seen total cash capital expenditure exceed the aggregate depreciation and amortisation charged against reported profits. But the excess has been spent on property, which tends to be expansionary expenditure and should hold its value. I am pleased aggregate working-capital movements have witnessed a relatively small outflow of cash. Within the last ten years, operating margins have only once topped 13% and have averaged about 11-12%. Such middling levels of profitability do not suggest the business enjoys a special edge over rivals. As such, I think it’s fair to say DWHA’s past progress has been due mostly to due some adept management. Return on average equity for 2014 was £3.9m/£22.2m = 17%. Stripping out the group’s cash from — and then adding back the pension deficit to — the equity base gives a similar 17% figure. So, not bad. But for any ROE calculation, it’s worth looking out for prior-year write-offs. Such items reduce the equity base and can flatter the ROE result… but at some point shareholders’ money was actually spent buying these written-off assets and this expenditure ought not to be forgotten. So, adding back the aforementioned goodwill write-offs of £5.6m, my return on average equity sum for 2014 comes to £3.9m/£27.8m = 14%. Not a fantastic figure, especially when 2014 earnings were an all-time high. Calculating the ROE figures prior to 2014 are not easy given all the write-off adjustments needed to profits and the equity base. However, a different ROE approach I can use here is to determine the incremental return on equity. This calculation tells me how much extra profit a business has earned for every £1 retained in the business. For example, between 2009 and 2014, DWHA’s annual earnings advanced by 7.8p per share after cumulative earnings of 135.2p were retained in the business. Retaining 135.2p for an extra 7.8p gives a return of 5.8%. Not great. Going back through previous five-year periods, I have to return to 2003-2008 to determine an incremental return on equity that’s greater than 13%. It seems to me the returns on equity produced in more recent years have been diminished by those mixed acquisitions and the sizeable pension contributions. Chairman Richard Dewhurst and group managing director David Dewhurst have served in their current roles since at least 1999 and can therefore claim responsibility for the subsequent run of dividend advances. Both Dewhursts are in their 50s, so succession plans are not an obvious requirement at present. Richard Dewhurst received a £126k basic salary and £85k bonus during 2014 — which does not look that excessive for a business making profits of £5m-plus. (I should add that DWHA’s directors appear to receive an annual bonus every year based on the level of reported profits). Mr Dewhurst’s pay has risen at a modest 3% per annum on average since 2003. Richard and David Dewhurst have a combined 13%/£6m stake while fellow members of the Dewhurst family enjoy at least a further 18%/£7m holding. Other promising signs include a 5p special dividend declared in 2013 and buybacks representing 13% of the share count performed at about 180p a share during 2007/8. I also like the fact the executives can work without needing an option scheme. I suspect any further growth will be dependent mostly on DWHA’s operations located outside of the UK. You see, domestic revenues have been range-bound between £13m and £18m since 2002, and the £16m recorded for 2014 was only 3% higher than that seen ten years ago. Of course, growing overseas can be somewhat harder than growing at home. I note a fair chunk of DWHA’s acquisition activity has been overseas and perhaps the greater difficulties of operating abroad led to some of those goodwill write-offs. But before I get to the numbers, let me explain DHWA’s two quoted share classes. The firm has: i) ordinary shares, with the ticker DWHT, and; ii) ‘A’ non-voting shares, with the ticker DWHA. Whether the voting rights of the DWHT shares are that valuable is hard to say. That’s because the Dewhurst family control at least 52% of the DWHT shares and therefore already have a voting majority. As I see things, the choice is either i) own the DWHT shares and have a vote, but be unable to outvote the Dewhurst family, or; ii) own the DWHA shares and not have a vote at all. With the DWHA shares at 400p and the DWHT shares at 550p, I would go for the non-voting DWHA shares every time. I’ve not taken DWHA’s cash position into account with my valuation sums, as I have offset that with the similarly sized pension shortfall. So, assuming 2014 adjusted operating profits can be sustained into 2015 and applying tax at the standard UK rate of 20%, I get possible earnings of £4.4m or 51.7p per share. The potential P/E on the 400p DWHA shares is therefore a lowly 7.7. However, the 9p dividend supports a token 1.6% income. Is it worth watching Dewhurst? There are very few quoted businesses around that offer an unbroken 15-plus-year run of dividend growth — let alone one where the management team responsible for such a record remains in charge. Better still, the executives boast significant shareholdings and appear to act in the interests of all investors. The shares do not look that expensive either. And yet I am not 100% convinced I should buy. For a start, there is nothing particularly appealing about this business. Margins are ordinary, ROE is ordinary and the past (and probably future) growth rate is ordinary. Don’t get me wrong — I am all for owning dull and low-profile businesses. But when I look through my existing portfolio, I see higher margins (e.g. FW Thorpe), higher ROEs (e.g. Andrews Sykes) and/or higher growth possibilities (e.g. Tristel). These are all features that tell me the businesses in question could be better than average, and hopefully more likely to deliver better-than-average gains as well. I am also concerned about the size of DWHA’s pension deficit. I see this scheme as nothing other than something to go wrong and it may well absorb even more cash that could instead be distributed as dividends. Another worry is the board’s tendency for acquisitions — and the potential for more write-offs. All told, DWHA offers appealing management that runs a not-so-appealing business. A P/E of less than 8 looks very tempting, yet I still harbour some reservations… and that tells me I would be better off passing on DWHA for now. A purchase today would be heavily biased towards ‘value’ rather than ‘quality’ and I’m keen to limit such investments — as they often go wrong for me. Nonetheless, I’d love to reassess DWHA if/when the pension liability becomes more manageable, the record on acquisitions improves and/or the ROE numbers move higher. Disclosure: Maynard does not own shares in Dewhurst. This entry was posted in Dewhurst, My Rejected Shares and tagged Dewhurst, DWHA on April 23, 2015 by Maynard Paton. Just to double-check my sanity for passing on DWHA (at least for now), I went back to FW Thorpe and how this share looked 10 years ago. …you will see some (badly taken) images of a TFW tip write-up by me from 2004. Back in 2004, TFW had operating profits of £5m — about equal to that of DWHA now. TFW was then also blessed with family management and middling-margin, dull operations, similar to DWHA now. TFW’s P/E rating at the time was about 7 as well. iii) the return on average equity for 2004 was a super 24% (adjusted for the pension deficit and cash position), indicating there could be something special about this business. So overall, 10 years ago, TFW showed loyal owner management, a cheap share price, decent ROE figures and a stronger balance sheet, and while the rest of the accounts were not spectacular, they did not carry many great worries either. As things turned out, TFW’s profits notably increased as margins rallied to 20% by 2008 and the shares are up five-fold since. I could not foresee that back in 2004, but perhaps such good outcomes are more likely when decent management are already combined with robust ROEs, manageable liabilities and organic expansion. Perhaps not relevant for most investors, but I believe that both Dewhurst and Thorpe presently qualify for 100% IHT relief.